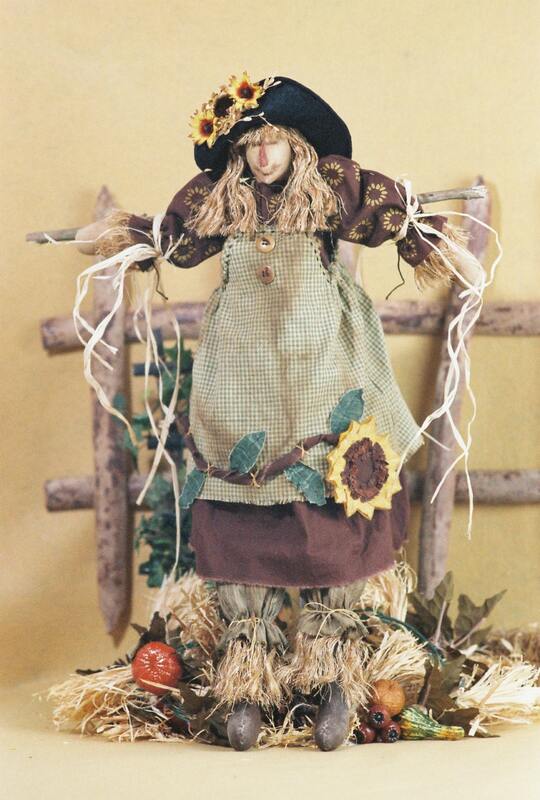 24" Tall Girl Scarecrow. Wonderful doll for Autumn & Halloween décor. Match with "Ebeneezer" pattern for the perfect Scarecrow couple. Her body is made of muslin that is painted and stained. Her face is needle sculpted. Her hair and straw coming out of arms and legs is unraveled hemp rope. Her dress is adorned with cloth sunflower branch. Her hat is felt. Easy to Intermediate Level PDF download comes complete with easy to follow instructions, doll pattern, clothing pattern and suggested materials list. Complete design, well explained. Recommend.